Wetherlam is the easternmost of the major Coniston fells, and its position on the eastern edge of the high ground means that it is prominent in many views from the Windermere area, even if it isn't always identified by name. It also forms part of the southern wall of Little Langdale, although most of the fell sits above the Greenburn valley. The main part of the fell takes the form of a bulky ridge that runs south from the summit into the Furness Fells. The ridge continues on for some way, but Wetherlam ends at Hole Rake, a valley that cuts across the top of the ridge. To the north-east Wetherlam Edge runs down to Birk Fell. Again the high ground continues on below the accepted boundaries of the fell. From the north there is little to split the two fells, while the walker approaching from Swirl Hawse will see Black Sails as the western part of Wetherlam - there is a slight dip between the two, but not much. Names don't help - High Wether Crag sits just below Black Sails. I've only climbed Wetherlam from the Coniston direction so can only vouch for two routes of ascent. The first goes via Levers Water and Swirl Hawse then runs along the top of Black Sails to approach the summit from the west. The second starts at the entrance to the Coppermines Valley, heads up a mine track then into Hole Rake. From Hole Rake a path leads up the main ridge, approaching the summit from the south. Swirl Hawse can also be reached from Greenburn, although there is no path in the upper reaches of the valley. A path reaches the summit along Wetherlam Edge, linking to routes from Yewdale. The boundaries of Wetherlam depend on your approach to Black Sails, which from some angles can be seen as a separate fell. If so the boundaries of Red Dell Beck in the south and Low Keld Gill in the north. If you take Black Sails as the western ridge of Wetherlam then the western boundaries run down from Swirl Hawse. In the north this is the upper reaches of Greenburn Beck, in the south Swirl Hawse Beck. Swirl Hawse Beck runs into Levers Water, which is drained by Levers Water Beck. The southern boundary of the main Wetherlam ridge is formed by Hole Rake, a valley that cuts across the ridge. Nameless becks run south-west out of this valley to join Levers Water Beck, while the upper reaches of Crook Beck flow north-east to join Yewdale Beck. In the north Greenburn Beck forms the entire boundary. 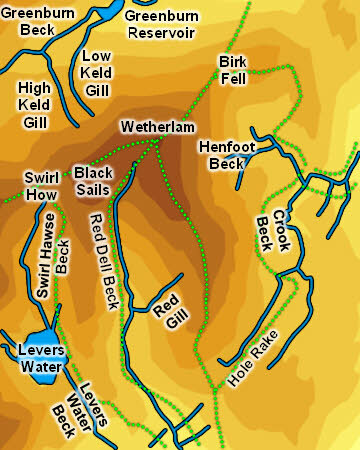 The north-eastern border is formed by Birk Fell Gill, which runs north into Greenburn Beck, and by nameless becks that flow south into Dry Cove Bottom then also join Yewdale Beck. Wetherlam overlooks Greenburn Reservoir, in the valley to the north. Levers Water falls on the boundary if you include Black Sails.